Ailinglaplap or Ailinglapalap (Marshallese: Aelōn̄ļapļap, [ɑ̯ɑ͡æe̯elʲe͡ɤŋ(ʌ)ɫɑ͡æbʲ(æ͡ɑ)ɫɑ͡æpʲ]) is a coral atoll of 56 islands in the Pacific Ocean, and forms a legislative district of the Ralik Chain in the Marshall Islands. It is located 152 kilometres (94 mi) northwest of Jaluit Atoll. Its total land area is only 14.7 square kilometres (5.7 sq mi), but it encloses a lagoon of 750 square kilometres (290 sq mi). The economy of the atoll is dominated by coconut plantations. The population of the atoll was 1,729 in 2011. Jabat Island is located off the coast of Ailinglaplap Atoll. The former president of the Marshall Islands, Kessai Note, was born on Jeh Island, Ailinglaplap Atoll. "Ailinglaplap" translates as "greatest atoll" (aelōn̄ (atoll) + ļapļap (superlative suffix)), because the greatest legends of the Marshallese people were created there. The four major population centers on Ailinglaplap Atoll are the settlements of Wotja, at the westernmost end of the atoll, Jih in the northeast, and Airek and Bigatjelang in the south. The British merchant vessel Rolla sighted several islands in the Ratak and Ralik Chains. On 6 November 1803 she sighted islands at 7°12′N 166°40′E﻿ / ﻿7.200°N 166.667°E﻿ / 7.200; 166.667, which was possibly Ailinglaplap Atoll. The next day six canoes of friendly natives came off. Rolla had transported convicts from Britain to New South Wales and was on her way to Canton to find a cargo to take back to Britain. In 1884, the Empire of Germany claimed Ailinglaplap Atoll along with the rest of the Marshall Islands. A number of European trading stations were established on the islands to Ailingkaplap as part of the copra trade. After World War I, the island came under the South Pacific Mandate of the Empire of Japan. Following the end of World War II, it came under the control of the United States as part of the Trust Territory of the Pacific Islands until the independence of the Marshall Islands in 1986. The current Iroijlaplap (or paramount chief) of Ailinglaplap is Anjua Loeak. Ailinglaplap Airok Airport (IATA: AIC) is located to the south: 7°16′45″N 168°49′32″E﻿ / ﻿7.27917°N 168.82556°E﻿ / 7.27917; 168.82556. Jeh Airport (IATA: JEJ) is located to the northeast: 7°33′54″N 168°57′42″E﻿ / ﻿7.56500°N 168.96167°E﻿ / 7.56500; 168.96167. Woja Airport (IATA: WJA) is located to west: 7°27′03″N 168°33′00″E﻿ / ﻿7.45083°N 168.55000°E﻿ / 7.45083; 168.55000. Students are zoned to Jaluit High School in Jaluit Atoll. In the 1994-1995 school year Ailinglaplap had one private high school. ^ Foreign Ships in Micronesia: Marshalls - accessed 31 July 2015. ^ "Public Schools ." Marshall Islands Public School System. Retrieved on February 21, 2018. ^ "Annual Report 2011-2012." Ministry of Education (Marshall Islands). Retrieved on February 22, 2018. p. 54 (PDF p. 55/118). "As such, Jaluit High School enroll students from the Ralik and Iolab school zones including schools from Ebon, Namdrik, Kili, Jaluit, Ailinglaplap, Jabat, and Namu." ^ McMurray, Christine and Roy Smith. Diseases of Globalization: Socioeconomic Transition and Health. Routledge, October 11, 2013. ISBN 1134200226, 9781134200221. p. 127. 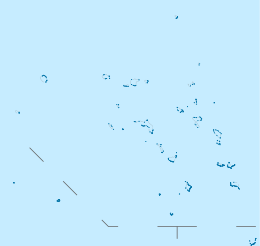 Wikimedia Commons has media related to Ailinglaplap Atoll. This Marshall Islands location article is a stub. You can help Wikipedia by expanding it.